the pulp blog: anxious times + dress sale! My sister and I tend to get stressed out collectively, probably because we're really close even putting aside the fact that we work together so closely. It is pretty nice having someone going through much the same thing, but there's also that downside of not having a chilled out person to calm you down. >.< The list of things we have to do for The Pulp Girls is never-ending, but those are the fun, even if time-consuming, things. When you add to that school, money, apartment, and lack of time in general... and you get two very anxious people in a way-too-small room. Hence my venting on here. Sorry guys. Okay. Here's some good news! 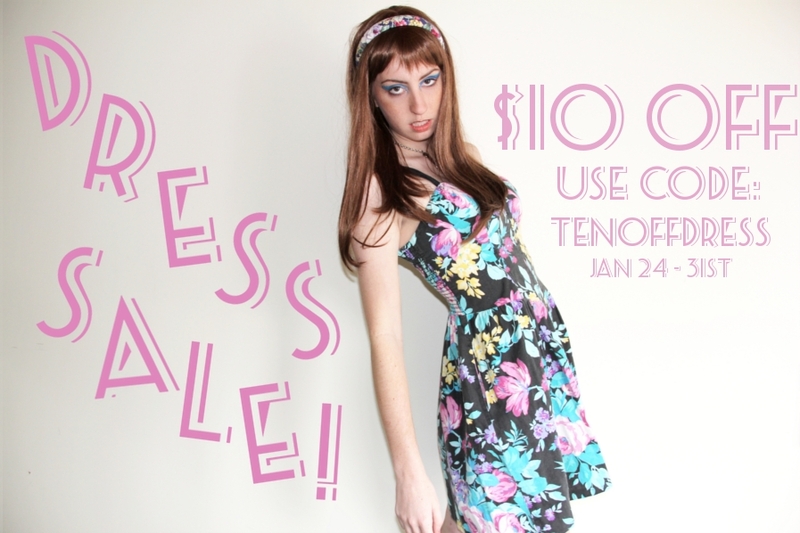 We're having a sale on dresses, those oh-so-essential spring pieces from Jan 24th -31st! Brighten up your wardrobe with floral prints or keep it classy in a little black dress. Either way, take $10 off your dress order with code TENOFFDRESS at checkout! Click on over to thepulpgirls.com and get your vintage before it's gone!